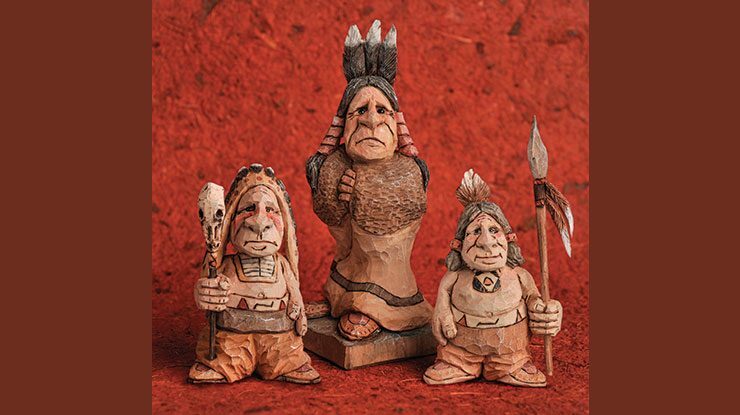 In Woodcarving Illustrated Fall 2015 (Issue 72) we shared an article by the late Don Dearolf on carving caricature Native Americans. Below are bonus patterns for two more projects. After I find a general pattern for a figure that I like, I’ll often cut a bunch on the band saw (or even pay to have oversized roughouts made), and carve each one differently. These figures are variations on the same pattern. Native Americans tend to have deep-set eyes and big noses. For the headdresses, most of each piece is carved in relief, except the tips of the feathers. I carved the feathers with a V-tool and knife. I added the feather fletches with a woodburner and a small skew tip. 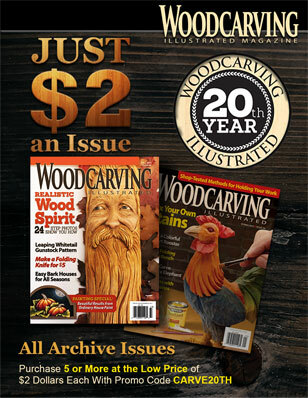 After you carve the pieces, burn along all of the detail lines with the woodburner and a skew tip. The burned lines help keep paint from bleeding. Burn all of the symbols. I use a nail set to make the dots on the headdress and a smaller nail set for the stitching details on the moccasins. Seal the carving with a light coat of Krylon matte spray finish. If you apply the finish too heavily, the paints won’t stick properly. When painting, I try to use as few colors as possible. I feel this gives me a better overall look for the piece. I thin the acrylic paints heavily, almost to the consistency of watercolor paint. After the paints dry, add a light wash of burnt umber to the whole piece. This wash should look like coffee with milk in it. This tones down the different colors and brings the whole piece together. When the wash is dry, dry-brush titanium white onto some of the high points. • Good quality paintbrushes: small liner for most parts, big round for the final wash, old flat for dry brushing. 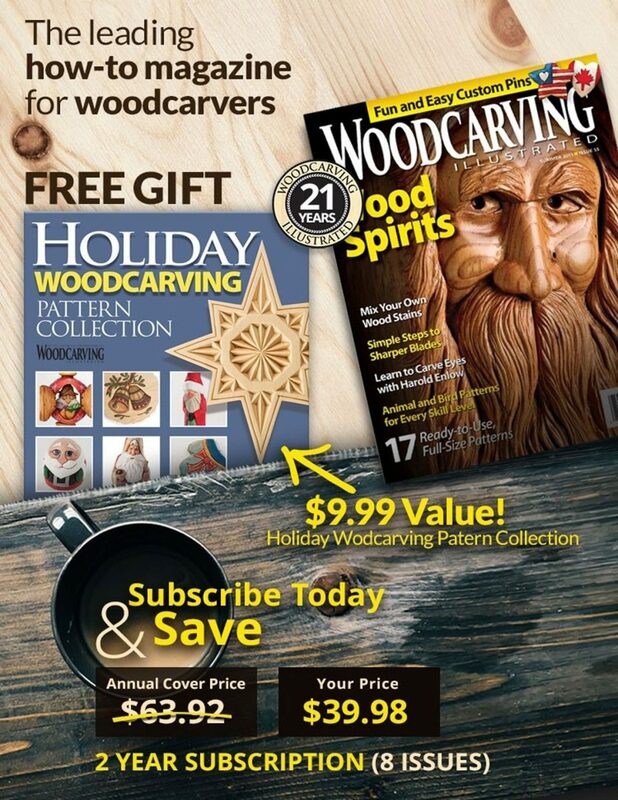 • For more great articles, click here to see Woodcarving Illustrated Summer 2018 (Issue 83). • Click here to purchase our Summer 2018 issue. 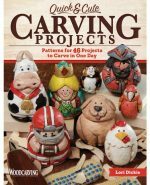 For more caricature carving, check out Quick & Cute Carving Projects by Lori Dickie. Available for 15.99 + S&H at foxchapelpublishing.com.